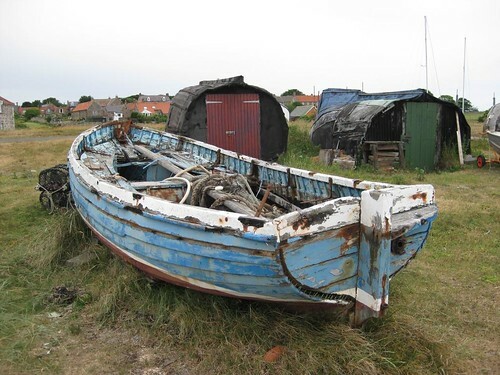 Alas, the famous salt-rusted taxis of Holy Island that so entranced the ultra-romantic H.V. Morton in 1927 are long rotted to pieces. But romantics of all kinds and conditions can do as I did this blowy day on the Northumberland coast – hoist their footgear and follow the ancient pilgrim path barefoot over the wide tidal sands. Tall rough poles mark the straight way, and there are barnacle-encrusted wooden refuge towers for foolish virgins to clamber into if beset by a rising tide. The ribbed sands felt cold to the sole. Bladder wrack crunched underfoot. It was a good long hour’s walk. The green sandhills and huddled village of the island seemed to draw no closer until the last moment. But this was a heavenly way to cross to Holy Island, or Lindisfarne, to give it an older and lovelier name. 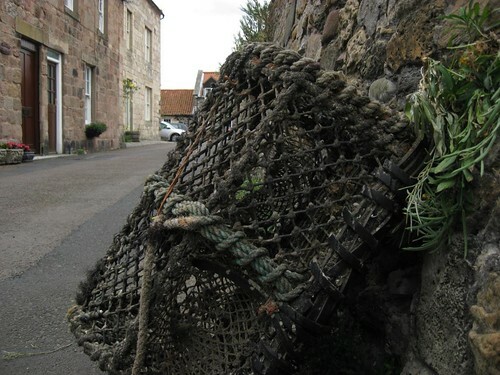 Holy Island village is still partly a fishing community, mostly for crab and lobster these days. Creels lean drying against house walls in the narrow lanes. 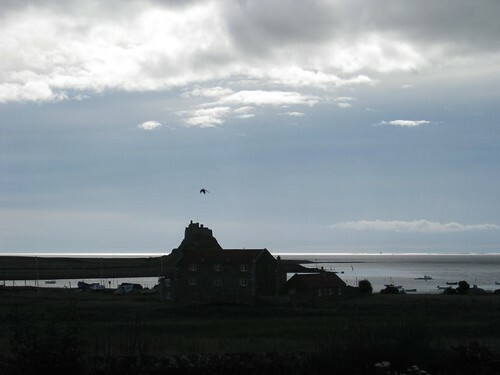 People come to Lindisfarne for its peace, its small-scale beauty and for its remarkable monastic history. 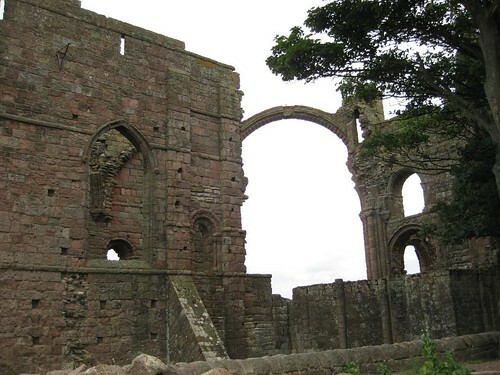 St Aidan of Iona established Lindisfarne’s monastery in the 7th century. St Cuthbert became its hermit Bishop and saintly icon. The ‘most beautiful book in the world’, the illuminated Lindisfarne Gospels, was crafted here. 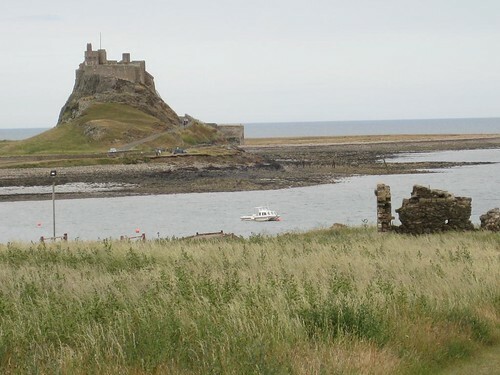 The little island off the Northumbrian coast kept alive the flickering light of Christianity during the Dark Ages; and when Holy Island was reoccupied after the Norman Conquest (the monks having fled Danish raids in 875AD) a wonderful new monastery was built here. 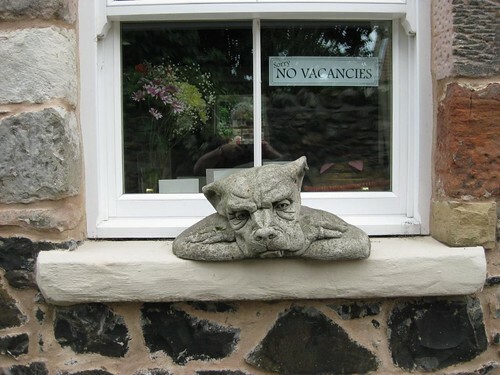 Lindisfarne is full of marvels. Wind and weather have sculpted swirling shapes in the red sandstone walls of the church, whose ‘sky arch’ springs 50 feet in the air, seemingly unsupported. Down by the harbour old herring boats, sawn in half and upturned, make fishermen’s huts. 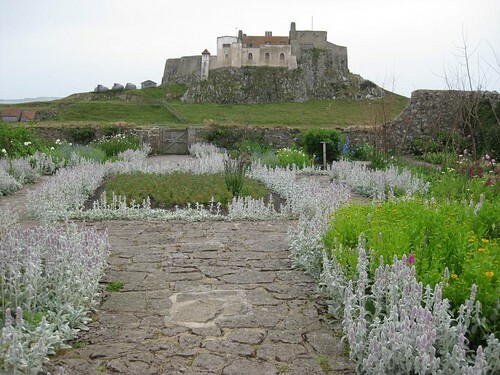 Lindisfarne Castle rides the basalt knoll of Beblowe Crag like a tall ship; Sir Edwin Lutyens redesigned it for drama, and Gertrude Jekyll laid out the walled garden ablaze with colour. Inland, the humps of the Cheviot Hills began to fade under rain. The island’s strollers vanished into the tea shops, and I was left alone to walk the north shore dunes, savouring wind and showers, the barking of pale-bellied brent geese newly arrived from Svalbard, and the eerie singing of seals on the sands. Fly Easyjet (www.easyjet.com) to Newcastle from London Stansted, Bristol, Belfast City. Train (www.thetrainline.com; www.railcard.co.uk) to Berwick-upon-Tweed (10 miles). Bus service 477 (www.perrymansbuses.co.uk) from Berwick. Road: Holy Island is signed off A1 between Belford and Haggerstone. Walk: (10 miles including sands crossing, 3½ miles island circular; easy; OS Explorer 340): From car park follow causeway, then pilgrim route posts, to Chare Ends on Holy Island (NB see below!). Follow road to Priory ruins (12648 – signposted). Return to Market Square; between Crown & Anchor and Manor House Hotel, follow path to shore. Left round harbour; on to castle (detour to Gertrude Jekyll’s garden – 136419). Continue on coast path, past The Lough and National Nature Reserve notice. Follow path to left along line of dunes for ½ mile to meet fence at NNR notice (129433). For island circular, left through gate, ahead to village. For sands crossing, keep ahead for ½ mile; bear left (122433) with causeway on right, to rejoin posts at Chare End. NB: Causeway is impassable 2½ hours either side of high tide. Tide times posted both ends of causeway; or visit www.lindisfarne.org.uk. More info: Berwick-upon-Tweed TIC (01289-330733); www.lindisfarne.org.uk; www.visitnorthumberland.com; www.ramblers.co.uk; www.satmap.com.